Making a difference through Mosaic mentoring: But what’s it like? Many people query about mentoring with Mosaic and often ask what’s it like? Well you’re about to find out. We’ve asked Amran Majid from Capgemini about his experiences, having mentored with Mosaic on our Enterprise Challenge and Secondary School Group Mentoring Programmes, both of which work inspire young people from deprived communities to realise their talents and potential by using volunteers to share their skills and experience. 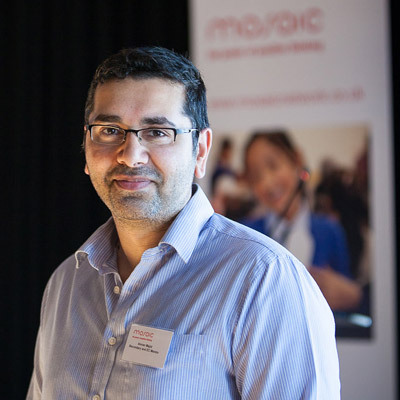 Nizam Uddin: How did you come across Mosaic and why did you decide to work with us? Amran Majid: I was introduced to Mosaic through Capgemini, which has a long tradition of engaging with the communities in which it works. It actively encourages employees at all levels to get involved, and operate in communities across the world. Capgemini is therefore always keen to be involved in the local community and when the opportunity came I thought it was a great chance to give back on behalf of myself and Capgemini. I started working with Mosaic last year on the Enterprise Challenge which is aimed at helping students develop and encourage their entrepreneurial skills. This year I decided to take part in the secondary school mentoring programme to help improve students’ confidence, self-efficacy and employability. Mosaic, with its emphasis on helping students from those poorer backgrounds has a passionate team dedicated to making a difference from primary school through to secondary. Their mission is one everyone should be able to get behind, but personally one I identified with given my own background. NU: How long did the programme run for and what did it involve? AM: The programme was run over six weeks, with one hour sessions each week. Each session focused on a different area, for example helping the students looks at their skills set, their motivation and ambition, communication skills, presentation skills and then team building exercises. The sessions were designed to push the students to become more self-aware, aware of others, confident and capable. NU: How many students did you mentor and did you see any changes in them during the course of the programme? AM: I mentored a group of 20 students from Washwood Heath Academy in Birmingham. I saw an amazing difference between the first and last sessions. The students went from having little or no confidence, to being positive and capable young adults. One student refused to engage at all in the first session, but by the end of the programme, she had not only gained the confidence to speak in front of the whole group, she was the narrator for the whole programme at the celebration event. This was in front of 50 people including the school leadership team, fellow students, and parents. I’m sure there are many adults who would find that daunting but she took it in her stride! NU: Why do you think mentoring is important? AM: Mentoring is absolutely critical to the types of students Mosaic works with. These are dominated by students who have little contact with anyone outside their family structure and school. Within these families the level of achievement and education is generally poor and many of them fail to achieve their potential because they didn’t know they had any. By giving students an appreciation of their own abilities through games, icebreakers and discussion, and giving them an insight into what they can achieve through the mentors as positive role models, they start to aspire to higher goals than they considered even possible. NU: Tell us more about the celebration event. AM: At the end of the programme the schools held a celebration event for the students, which was an opportunity for the students to share their experiences with the school leadership team, their parents and some other students. For the event the students were given graduation gowns to wear and each spoke briefly about what they had done, what they had enjoyed and what they had taken away. It was amazing to hear how much the students had actually grown and appreciated the opportunity. Many of them wanted to do it again next year, which is a great endorsement for the programme and those involved. NU: And last but by no means least, what did you get out of this experience? AM: For me it was knowing I had made a difference to these student; that the time I spent with them had given them the tools and confidence to trust themselves. The best moment for me, and evidence that I had made a real difference was the number of parents talking to me about how they had seen their son/daughter change in a positive way; and not just at school but even at home. A number of parents asked for photos of me with their children, so they could use it as a reminder of the programme and what can be done. It’s an amazing and humbling thought that with a little investment of our time as professional adults we can make real and lasting changes to so many children. I’m sure if we could get more people involved, we could make even more of a difference to schools around our offices and homes. I’m looking forward to going back next year. Find out how you can mentor on our Secondary School Group Mentoring Programme. Find out how you can mentor on our Enterprise Challenge.